This delicious cranberry salad is filled with fresh cranberries, red grapes, shredded coconut, toasted walnuts and freshly whipped cream and makes a beautiful presentation on the holiday table! This cranberry salad is a tribute to my mother-in-law, who passed away, unexpectedly, earlier this year. She was 92 years old, but in great health. When Scott and I got the call while visiting our daughter in London, it was a great shock. She (Nanny) was our Thanksgiving cooker for many, many years – so when this season rolls, around I can’t help but think of all the delicious turkey dinners she pleased us with. Nanny was a pretty traditional cook and didn’t veer much from the classic Thanksgiving spread. There was always a big beautiful turkey. Every year she’d worry that it “might be dry” and every year it was super moist, perfectly tender and golden brown, to boot. We could also, without exception, plan on a big bowl of silky smooth mashed potatoes and an unending supply of her delicious turkey gravy. Being brought up in the 20’s and 30’s, Nanny didn’t try a ton of new recipes but one year she surprised us. 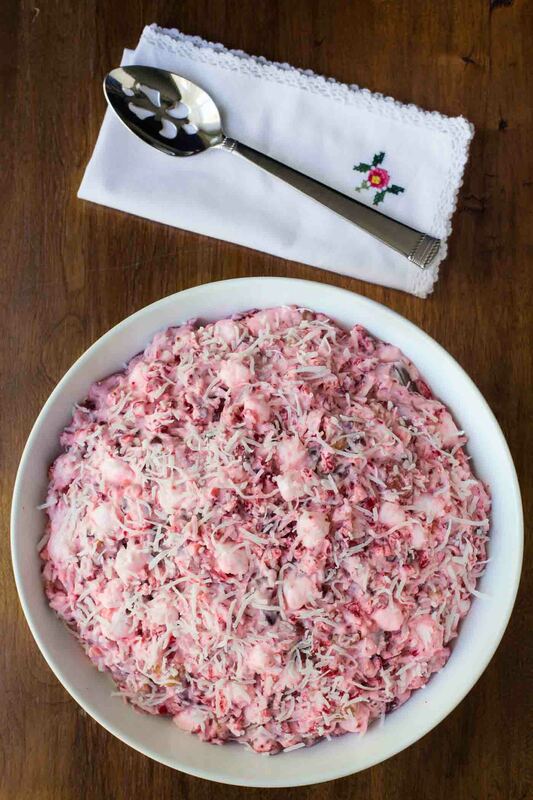 Instead of serving a traditional cranberry sauce, we noticed a beautiful cut glass bowl, filled with a fluffy pink salad on the Thanksgiving table. It was a gorgeous color and had finely shredded coconut dusted over the top. Nanny had clipped the recipe from a magazine and thought it might be a nice variation. We LOVED it, especially my daughter Cait and I. We requested it every year after that and Cait and I could just about eat our weight in it. If there were leftovers, we were thrilled to take them home to enjoy the next day as the salad keeps well. Cait has carried this cranberry salad tradition on with her family and they love it as well. In fact, her three daughters enjoy it so much, they also request it for Christmas dinner. I made sure that Nanny’s beautiful cut glass bowl was passed on to Cait. Now she can have a sweet memory of Nanny, each year when the holidays roll around. I thought this would be a good year to share the wonderful cranberry salad recipe in memory of Nanny. It’s filled with cranberries, red grapes, walnuts, marshmallows, shredded coconut and whipped cream. It doesn’t take much time to put together, and can be made early in the day (or even a day ahead) and kept in the refrigerator till just before dinner. Serve it in your prettiest bowl – it will make a lovely presentation and you’ll probably find yourself getting requests for it again and again. 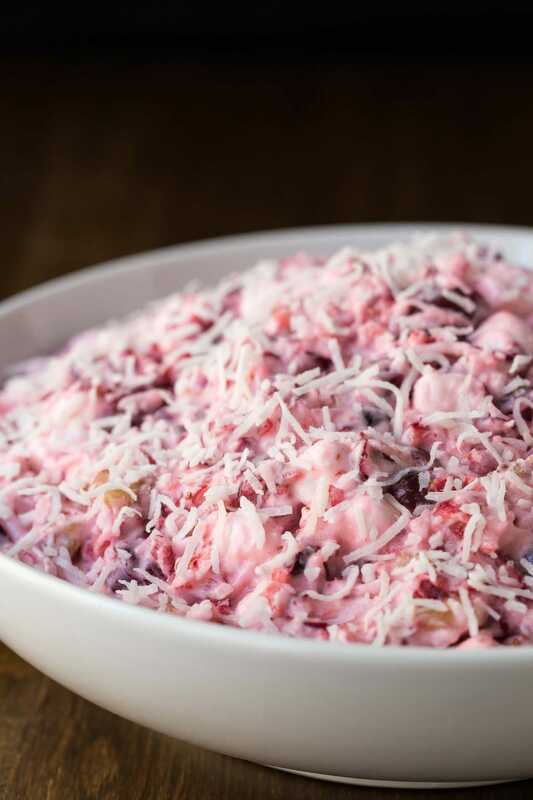 You can call it whatever you want, but for us, it will always remain Nanny’s Wonderful Cranberry Salad. It wasn’t part of Nanny’s recipe, but I like to toast the walnuts and let them cool before adding to the salad. If you don’t have time, the salad will still be wonderful, but toasting gives them an extra crunch. 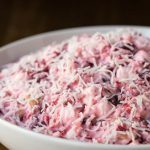 I use sweetened coconut in this cranberry salad but unsweetened will also work. When you first combine the cranberry mixture with the whipped cream, it will seem too runny. No worries! It will thicken up as it sits and the marshmallows soften a bit. Make this cranberry salad early in the day or even a day ahead. It will keep well in the refrigerator. I like to add the coconut garnish just before serving. I used my KitchenAid Pro Line Blender for chopping the cranberries for this salad. I love this beauty of a machine and use it just about every day. It’s super heavy duty and acts as both a food processor and a blender. It can be used for fruit and vegetable smoothies, silky, smooth juices, nut butters, salad dressings, soups, hummus, If you have a cook on your gift list, this would be an amazing, well-used gift. P.S. I hope Nanny wouldn’t mind, I sometimes I embellish the old family recipe with a scatter of beautiful pomegranate arils. If you like a more traditional cranberry sauce, this Pomegranate Cranberry Sauce is also delicious! This delicious cranberry salad is filled with fresh cranberries, red grapes, shredded coconut, toasted walnuts and freshly whipped cream. It makes a beautiful presentation on the holiday table! Preheat oven to 350˚F. Spread walnuts out in a single layer on a shallow baking pan. Bake for 8-10 minutes until light golden brown. Set aside to cool. Wash cranberry and drain well. Pick out any bruised or damaged berries. Pulse cranberries in a food processor until coarsely chopped. Combine cranberries with sugar and stir well to combine. Add grapes, coconut, marshmallows and toasted walnuts. Whip cream until soft peaks form. Fold whipped cream into cranberry mixture. Dust with more a little more coconut. See Café Tips above for further instruction. I just finished making this recipe for tomorrow’s Thanksgiving dinner and made it exactly as written. I hope it makes it until then – we all keep going back to sample it because it’s so darned yummy. 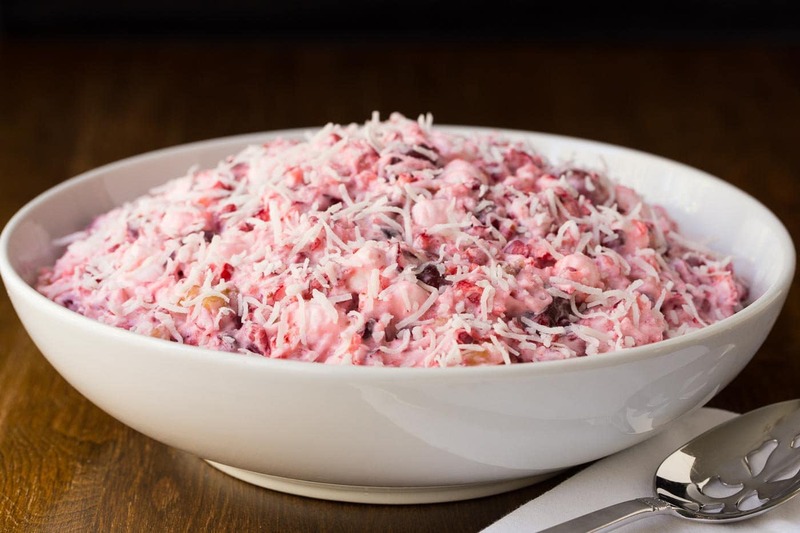 I was nervous about serving it because it does sound like a dessert, but the flavors are just right – the tartness of the raw cranberries with the nutty flavor of walnuts and the sweetness from the marshmallows & coconut are perfect! I will serve a traditional cranberry sauce (and even a small can of cranberry jelly for those die-hards that have to have their jelly!) but I have a feeling Nanny’s Wonderful Cranberry Salad will be the hit of the buffet table. Thanks for another fantastic recipe – love your website and all the fun emails you send out. Happy Thanksgiving! Is this a desert? I usually serve a cranberry relish to help cut through the rich dinner. This sounds really good, but marshmallow ate in the same bite as turkey seems strange to me. Happy Thanksgiving and thank you for the great recipes. Hi Tammie, this could be a dessert although we serve it with our Thanksgiving dinner. I usually also make a more traditional cranberry sauce/relish. Hi. I made this for a potluck. It is very good. Not too sweet (I dislike very sweet things). A very refreshing accompaniment to heavy winter dishes. I’ll be making it again for Christmas! Happy Holidays!!!! If you can’t get fresh cranberries, would you use canned, or soak dry cranberries? So sorry but I don’t think canned or dry cranberries will work for this recipe. I made Nanny’s Wonderful Cranberry Salad this past weekend for a Christmas gathering with friends. I did not get a chance to taste it. It was all gone by the time I got around to it. I was told by several people that it was “delicious.” They asked for the recipe. So I will share your recipe with them. Thank you for sharing. Aww… what a sweet and kind comment. Thanks so much Catalina, that makes me happy that your friends enjoyed Nanny’s salad! What a wonderful recipe to share this year. Nanny sounds like a wonderful woman and I know she will be greatly missed this year, and during all the holidays. This is a lovely salad and perfect for the holidays. The color is fantastic and I love the combination of flavors and textures too. Hope you and Scott have a fantastic Thanksgiving! What a great tribute. It’s these kind of traditions that make the holidays! Love the add-ins. Happy Thanksgiving! As a big cranberry fan, I can’t believe I haven’t tried this kind of cranberry salad! I will be trying this one out 🙂 Have a most wonderful Thanksgiving Chris and Scott (and family :)! Thanks Mercy! Enjoy and Happy Thanksgiving to you! Looks delicious Chris! I will definitely try this recipe! Thank you for sharing! Happy thanksgiving! Should the cranberries be cooked around 6 minutes instead of going straight into dish out of bag? Thank you! This looks good and I want to try it this year! No, the cranberries are not cooked at all. That’s what makes this salad so good and fresh tasting! You just chop them and combine with the other ingredients. I think you will love it! Happy Thanksgiving! So pretty, Chris! This looks like a holiday classic! I love the story, Chris, my grandmother was a traditional cook, too, but the memories are just as delicious! I am definitely going to try this salad, I love cranberries, but I’ve never had anything like it! What a delicious memorial to Nanny, Chris. I’m glad Cait got to have Nanny’s cut glass bowl too 🙂 The salad is not only beautiful but sounds delicious too! I remember your sorrow at nanny’s passing..how sweet to keep her traditions! I’ve never seen anything like this, and it is so pretty! I love the pretty pinky colour. 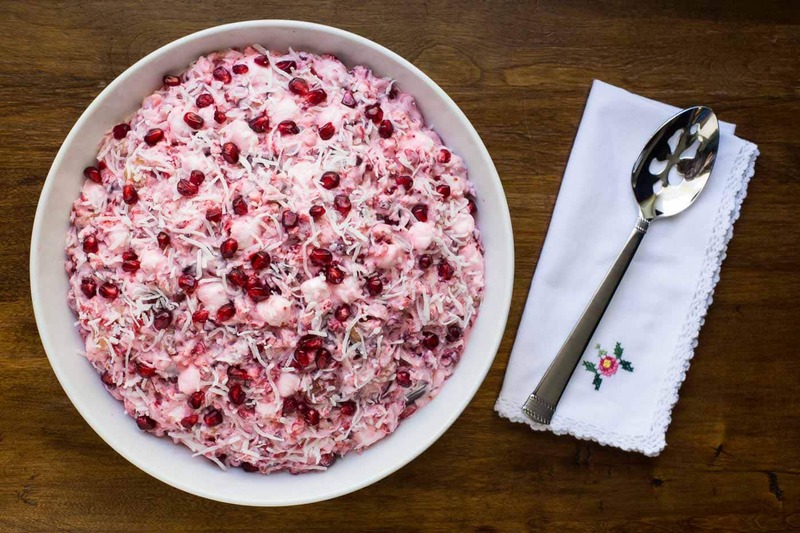 Have never had cranberry salad this way…now I am really intrigued as it has so many wonderful ingredients in it. A wonderful tribute to mother-in-law, Chris.